If I closed my eyes and listened to the market sounds around me, I easily could have been transported to one of my weekly pazars in Istanbul. Instead, we were in the midst of the bustling Friday market day at the Türkischer Markt in Berlin, Germany. In November, we spent a long weekend exploring this former divided city for the first time. Visiting this Turkish market was one of the highlights for me as I still get bouts of homesickness for my beloved Istanbul. Here at the market, I found Turkish simit and pide, green and black olives galore, beyaz peynir and other varieties of cheese, pickled veggies, prepared Turkish mezes, fish mongers, meat sellers, pomegranates, mandalina and a plethora of fresh produce. 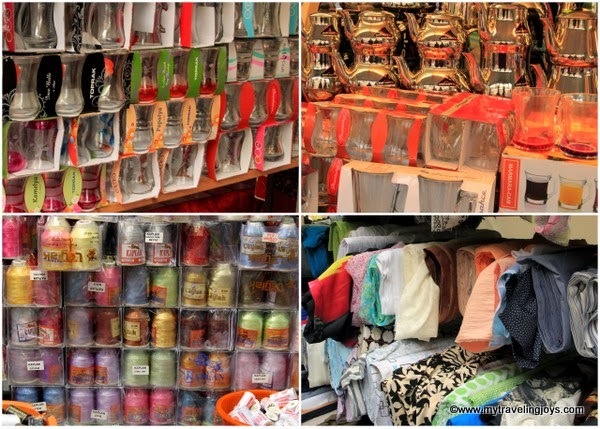 The market even had a small section that looked exactly like the backstreets of Eminönü with its bolts of fabric, thread, yarn, boxes of buttons and çay glasses and teapots. I saw head-scarved ladies haggling over their purchases just like they do in Istanbul. I was still surprised to see so much of "Istanbul" here in Berlin. Just hearing Turkish being spoken made me giddy! And anytime I spoke to one of the sellers in Turkish, I got surprised reactions that this blonde-haired yabanci could speak Turkish AND that I was not German. To make the conversation easier, I told the sellers we still lived in Istanbul and were on holiday. Buy why indeed was I buying Turkish olives and cheese if I was on holiday? As I’ve mentioned before, I love visiting markets wherever we travel. While planning this trip, I heard about the Türkischer Markt and couldn’t resist booking a hotel about 2 km away so we would be close. My husband indulged my plea to visit this market when he would rather have been exploring historical sites. However, husbands everywhere should know that: happy wife = happy life. And I was happy! If I had more luggage allowance, I would have smuggled back more Turkish delights. 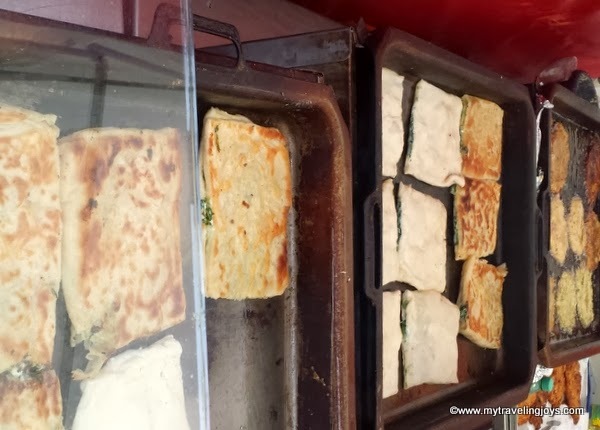 But I was content with my few purchases and reveled in each and every bite of my crispy cheese and spinach gözleme. A slightly different version of Turkish gözleme, but still tasty. The Türkischer Markt is open year-round from 11:30 a.m.-6.30 p.m. on Tuesdays & Fridays. It runs along the south side of the Landwehrkanal from Kottbusser Damm. One of the entrances is located at the intersection of Kottbusser Damm and Maybachufer. At another end of the market, local hipsters gathered to listen to live music. @Julia, yes, we loved Berlin! Just a 5-hour train ride from Warsaw. :-) Hope to post some more Berlin photos later this week but am still deep in my Polish classes! Türkenmarkt is such a great Berlin institution - I always get my Turkish fix there when in Berlin. we are starting to get more turkish stores here and i am loving it but we have nothing like that markt! @Barbara, I can certainly see why! We loved the market! I think you have well developed Turk yemeği antenna. You seem to be able to find it where ever you are. Yes, we loved Berlin! And hope to return again...maybe even this year. Hi Joy! We too loved Berlin when we went last year! But we didn't know about this market which looks just like the real thing! @Claudia, I imagine since you guys live in Turkey, you don't need to go off rushing for Turkish supplies in another country. Glad you enjoyed Berlin as much as we did! Hopefully, we'll see you soon.